Rose Charlie belongs to the Chehalis Band in the Sto:lo Nation, is a member of the Union of B.C. Indian Chiefs and was named the Grand Chief of B.C. Charlie founded the Indian Homemakers Association of British Columbia and the National Indian Brotherhood, now the Assembly of First Nations, and the B.C. Association of Non-status Indians. She helped restore Indian status to over 16,000 women and 46,000 first-generation children of mixed ancestry. 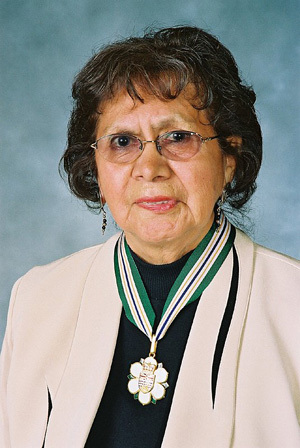 Rose also helped found two of the most important Native women’s groups in Canada, the National Association of Indian Rights for Indian Women and the Native Women’s Association of Canada. In 1989, she received an honorary doctor of laws from UBC.